Compiled by Yve Susskind, of Praxis Associates, for Journalism That Matters and the Agora Center for Journalism. The themes listed in this document represent the collective wisdom of the 130 attendees at the May 2017 Elevate Engagement conference co-hosted by Journalism That Matters and the University of Oregon School of Journalism and held at the Agora Journalism Center in Portland. Themes through Saturday A team of seven students, working under the direction of Yve Susskind and Lori Shontz (U of O Journalism School faculty member), documented “nuggets of insight” that they heard in all conference activities, Thursday through Saturday. They focused their attention through a set of conceptual lenses, such as “reflections on the way things are now and what needs to change,” “emerging responses and aspirations,” and “areas of tension or uncertainty.” Each day, the team met a few times to cluster the “nuggets.” On Saturday night, Yve developed the clusters further into distinct themes with representative quotes. Yve also incorporated into the theming process data from several group “harvests” – activities that engaged participants in surfacing insights and emerging themes – as well as graphic recording posters by Nitya Wakhlu, and an analysis of the conference Twitter stream. These themes are presented in the Themes through Saturday document. Manifesto: This document, authored by Joy Mayer, Kyle Bozentko and March Twisdale, captures the aspirations of the community of practice to “elevate engagement so that each of us and all of us thrive,” the forward-looking question for the last day of the conference. On Sunday, groups of participants each reviewed one set of artifacts from the conference to distill nutshell paragraphs capturing the essence of the story. 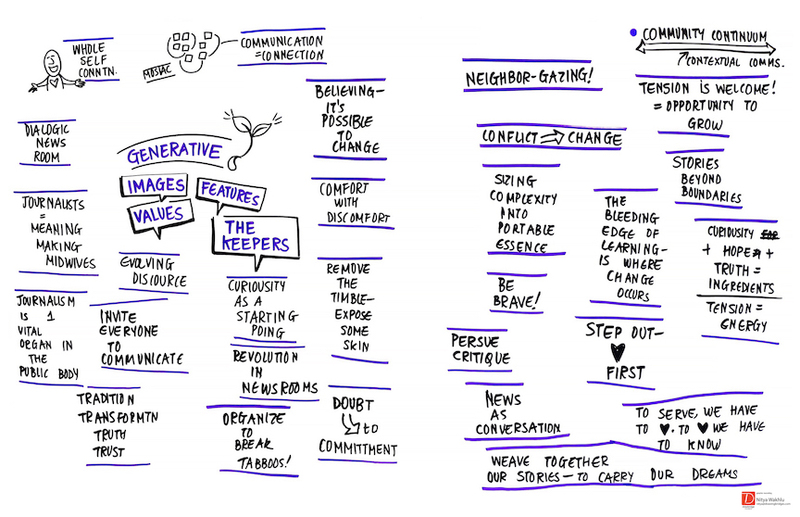 Joy, Kyle and March incorporated these Nutgraphs, as well as Nitya Wakhlu’s graphic recordings from Sunday morning discussion notes and Generative images into the Manifesto. Headings in black indicate that sub-points came from multiple sources. Representative quotes, as captured by the student note-takes, are provided for many of the themes. Journalists need to stop standing outside, they need to become part of communities and be like hosts (in the way that hosts are not “objective” facilitators). WHAT MUST BE DONE SO THAT JOURNALISM CAN TRULY SERVE COMMUNITIES? Engage first. Deep radical engagement implies engagement before the journalism. We must listen and engage and develop stories from there. Experiences that bring people together and build understanding. More information can actually create more splits between people. Are we ‘Columbus’ing engagement that ethnic media, embedded in communities, have been practicing all along? Let’s be honest about what we mean by community. Can media organizations embrace the idea of letting communities know we love them? This work requires a shared narrative, access to best practice and resources, support, crowdfunding, and conversation about the influence of money, the culture of the industry, and how we are getting this wrong, that invites all perspectives. It requires collaboration.